Cut the baguette in half but not all the way through. Open it up, and spread the hummus on the top inside and the pesto on the bottom inside. Spread the shrimp on the bottom. Cut the blue cheese into 4-6 small chunks a spread over the shrimp. De-pit the olives and lay them along the shrimp as shown in the photo. Toast the open sandwich until the cheese just starts to melt. While toasting, mix the mayo with the smoked paprika and the chipotle. 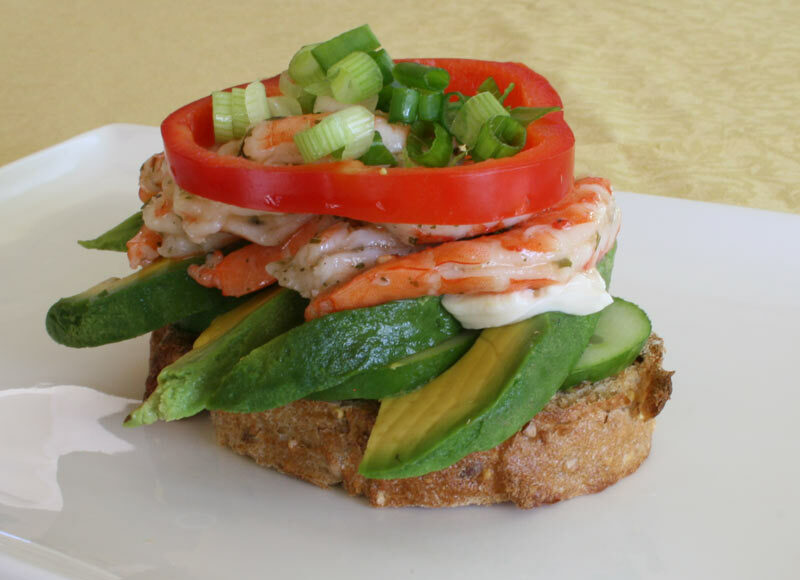 When the sandwich is ready, spread the mayo on top of the shrimp (and melted cheese). Cut a few slices of red onions, about 1 or 2 cuts = 10 half-onion rings. Lay them on top. Then close the sandwich and enjoy. This sandwich was wonderful. To completely confuse my taste buds, I added slices of pink sushi ginger. Thank you! Good call with the ginger, we’ll try that sometime !